The Fair Trade concept is an international movement that aims to ensure producers in 3rd world countries get a fair deal for their products. 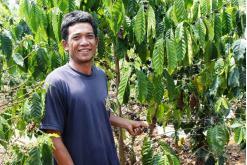 Producers of crops such as coffee, tea, cocoa and rice are paid a fair price and offered long-term contracts to guarantee a sustainable livelihood. Fair Trade strives for a more just distribution of revenues resulting from global trade relationships. The working and living conditions of producers and workers in economically disadvantaged regions should be improved by creating market access for their products and fair conditions. Fair Trade fosters sustainable development. It strives for social justice, economic development, environmental protection and the maintenance of cultural diversity as well as contributing to stronger trade relations between countries in the southern hemisphere. The social and environmental standards that Fair Trade strives for comply with national law and the conventions of the International Labor Organization (ILO). Frequently they go beyond the minimum requirements set. For Fair Trade to work, everyone along the trade chain must cooperate and take their share of responsibility. This requires ongoing information sharing and awareness raising. Sensitising consumers to the need for greater equity in the global allocation of goods is also an integral aspect of fair trade. The credibility of Fair Trade is ensured by independent inspections and control. Why is there a need for Fair Trade? The advantages of current international trade practices are only felt by a small percentage of the world’s population – mostly people in wealthy countries. Small farmers are significantly disadvantaged when it comes to operating in world markets. They usually lack access to market information (eg pricing), transport and infrastructure to get their goods to a market of their choice. The consequence of this is that they are completely reliant on middlemen to come and purchase their product at their ‘farmgate’. Without any knowledge of world market prices and the lack of resources to seek out other buyers, they have little power to negotiate and are often exploited. There are few alternatives for many of the farmers and to survive some turn to the cultivation of narcotic substances, child labor, migration to the slums of major cities or emigration. Similarly, many plantation workers endure low pay, unsafe working environment and poor living conditions. Too often they lack the right to form unions and participate in decisions that affect their life on the plantation. Fair Trade strives to secure decent working conditions for plantation and factory workers according to standards set by the International Labour Organisation (ILO). The Laotian coffee (in Rhino) is grown in the Champasak Province of Southern Laos by the Bolaven Plateau Coffee Producers (AGPC). According to the International Fund for Agricultural Development (IFAD), AGPC is making great progress with the management of it’s cooperative and the quality of the coffee they are producing. IFAD expressed that AGPC has established a transparent process and clear policies to manage funds and distribute resources among it’s members. IFAD thought this was key to it’s success. Mr Ki is a successful member of AGPC; he received technical assistance through the co-op and was able to increase his coffee field from 1/2 ha to 2.5 ha. With the extra funds he has since built a new, secured his childrens education. His next challenge is to improve his water systems and getting access to electricity. His biggest problem used to be running out of cash and having to sell his coffee for less than it was worth because he couldn’t wait for a better price. We are currently the only company selling certified Fairtrade coffee from this co-operative in Australia, most of their crop is sold to France. A report was produced by Lao’s Ministry of Agriculture and Forestry, Dept of Planning and Investment about our Laotian coffee producers – the Bolaven Plateau Coffee Producers (AGPC). You can read the full report here 201203 AGPC Rural Devt Report. For technical info on Fair Trade such as Fair Trade standards for different products visit the international governing body, Fairtrade Labelling Organisations International (FLO) at www.fairtrade.net. This certification label is your independent guarantee that a product meets International Fairtrade standards. Visit www.fairtrade.net to find out more. Australian Fair trade wholesale sales grew by 200% from 2009 to $150 million in 2010. Worldwide Fair trade retail sales in 2009 were estimated at US$2.4 billion. The yearly Fair trade benefit for 2009 to coffee and banana growers alone is $45 million.